More chocolate chip cookies are baked in home kitchens than any other cookie, so there's no shortage chocolate chip cookies recipes to choose from. Most everyone has their favorite recipe for chocolate chip cookies. While I love all kinds of traditional chocolate chip cookie recipes, I also like interesting chocolate chip cookie variations like this one for Mexican Double Chocolate Chip Cookies. Cinnamon and dutch processed cocoa powder are added to an easy chocolate chip cookies recipe, resulting in cookies with the flavor of Mexican hot chocolate, a very popular beverage in Mexico and with good reason—It's delicious! 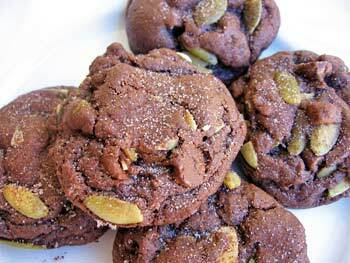 This easy Double Chocolate Chip Cookies recipe calls for pumpkin seeds (pepitas) which you may be able to find in your health food store. I'm able to buy pepitas at Trader Joe's here in Phoenix, but wouldn't even begin to try to find them during the summer when I'm in very rural Northern Wisconsin. If you can't find pumpkin seeds, you can substitute any nut of your choice or just leave them out. These chocolate chocolate chip cookies are really easy to make thanks to the use of melted butter in the cookie dough. The recipe's developer, Lauren Chattman, author of Mom's Big Book of Cookies , is both a Mom and a trained pastry chef. She contends that cookies made with melted butter have a better texture than those made with softened butter! After trying this method in several of her cookie recipes I'm a fan. The cookie dough will need to chill in the refrigerator for at least 15 minutes before baking to allow the dough time to firm up a bit. Although the recipe doesn't suggest it, I sprinkled my scoops of cookie dough with a little cinnamon and sugar before baking and again when they came out of the oven and thought it worked well. In a medium bowl combine the flour, cocoa powder, cinnamon, baking soda, and salt with a whisk and then set it aside. In a large bowl, stir together the cooled melted butter and sugars with a wooden spoon until smooth and well blended. Add the vanilla and eggs, stirring again until smooth. Stir in the chocolate chips and pumpkin seeds and (if using). Place the cookie dough in the refrigerator for 15 minutes (or up to 6 hours) to let the dough firm up. While your dough is chilling, preheat your oven to 375F degrees. For best results, line baking sheets with parchment paper or silicone liners. Alternatively use ungreased cookie sheets. Drop by heaping tablespoonfuls onto lined cookie sheets, leaving about 3 inches between cookies. Bake for about 8 to 10 minutes until set. Remove from the oven and cool cookies on baking sheets 5 minutes then transfer cookies to wire racks to cool completely or enjoy warm. This recipe yields about 48 Mexican Double Chocolate Chip Cookies. Chocolate Chocolate Chip Cookies Freezer Option: Balls of the Mexican Chocolate Chocolate Chip Cookies dough may be placed next to each other on parchment lined baking sheets, frozen, transferred to plastic bags, and stored in the freezer for up to 1 month. Frozen chocolate chip cookies may be placed in the oven directly from the freezer and baked as directed. They may take 1 to 2 minutes longer to finish baking.